The 4th Islamabad Literature Festival will run from April 15 – 17 at various venues throughout the city. For information on how to register to attend click here. The full programme of the 10th Asia House Bagri Foundation Literature Festival has just been announced. The Festival is a celebration of Asian writing and writers, as well as of books of Asian interest. It will run from May 4 - 18 at Asia House’s central London headquarters. For more details click here. Index on Censorship is a UK-based international organisation promoting free speech. Each year it grants freedom of expression awards in various categories. This year’s awards will be announced in London next month. Indonesia’s first female stand-up comedian, Sakdiyah Ma'ruf, who battles Islamic fundamentalism through ridicule, has been nominated in the arts category. For more about her click here. About the book: When Stamford Raffles married Sophia Hull in February 1817 and a year later welcomed the arrival of his first child, Charlotte, family life looked to be full of happiness. His earlier marriage to an older widow, Olivia Mariamne Devenish, had ended with her death in Java, leaving him bereft. Now, settled in Bencoolen as Lieutenant-Governor, he watched with satisfaction over the growth of Singapore and the increase in his young family. But death and misery were never far away. About the authors: John Bastin is Emeritus Reader in the Modern History of South East Asia in the University of London. He was Professor of History and Dean of the Faculty of Arts in the University of Malaya and Reader in the Modern History of South East Asia at the School of Oriental and African Studies, London. He is the author of numerous books and articles on the history of Indonesia, Malaysia and Singapore and is a leading authority on Sir Stamford Raffles. Julie Weizenegger lives in Victoria, Australia. She has been a genealogical researcher for 40 years and has a special interest in both Australian and British history. She particularly enjoys interrogating the veracity of historical facts. 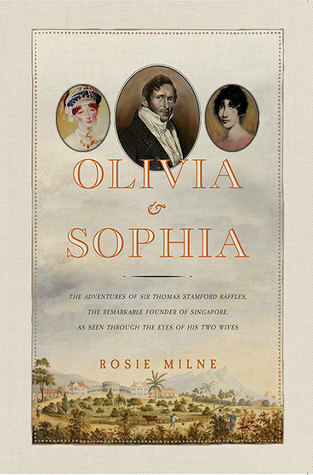 Companion reading: I can’t help remarking that The Family of Sir Stamford Raffles would make excellent reading alongside my own novel, Olivia & Sophia, a fictionalised version of the events of Raffles’ life, as seen through the eyes of his two wives. Each week I make a suggestion of an interesting Twitter account you may like to follow. This week, Indonesian Writers, @idwriters, a site devoted to showcasing Indonesian writers, along with their publications, journals, and other literary resources in English.